Hey everyone! 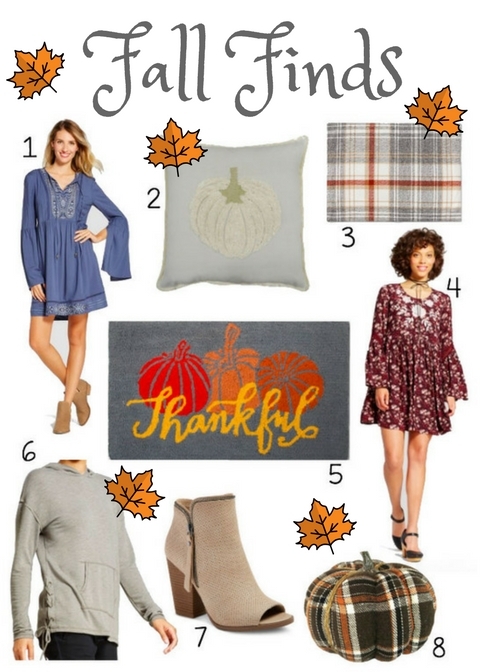 I'm back today with some fun fall finds (like that alliteration lol?) from Target. I was there over the weekend and wanted to buy EVERYTHING. Don't worry Mark, I refrained! It's still pretty warm here but I'm excited to pair some long sleeved (one, four) dresses with ankle boots (soon) and then leggings and taller boots later in the year. So many cute options! This lace-up sweatshirt is way cuter in person. I love how it will be easy to throw on for a breezy day but isn't too heavy. I am imagining it layer with a vest when it gets a little cooler as well. They had an olive green version in stores but only had large/ x-large left. Bummer! Christmas is definitely my fave holiday to decorate for but fall is a close second. I love all the earth tones for Fall and you can't go wrong with plaid. Finding different patterned pumpkins in various sizes is one of the easiest ways to decorate for fall. Cluster them in threes and boom you're done. I have a few grouping of pumpkins in my house right now. I change out the throw pillows on our brown couch throughout the year and the fall pillow are my fave! I have a plaid pillow, a few pumpkin pillows similar to the one pictured, and a velvet "gather" pillow. Such an easy way to change the vibe of a room. Hope you have a wonderful day and yay for fall almost being here!! I love all the fall finds, especially the boots! I love the color of the lace-up sweatshirt. Fall is one of my favorite times of the year so I really like to dress up.